The “First Bite” Menu Release Party is sponsored by and held at the all new Mercedes-Benz of Bonita Springs.The net proceeds will directly benefit the animals at the Humane Society Naples and Gulf Coast Humane Society. Be the first to see the Winter Edition SWFL Restaurant Week Prix Fixe menus and enjoy unlimited “First Bite” samples from over 30 of our participating restaurants. This premier event will showcase the amazing culinary skills of our local SWFL chefs and restaurants in the backdrop of the stunning new Mercedes-Benz of Bonita Springs. Your all-inclusive Greg Norman Collection VIP ticket includes: One (1) Free T-shirt voucher from the Greg Norman Collection at Miromar Outlets and you will also receive one (1) Free Greg Norman “Shark” hat pin the night of the event. 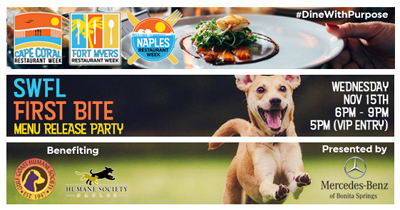 All tickets include: —- Complimentary valet parking, “First Bites” from over 30 participating SWFL Restaurant Week restaurants, meet & greets with the chefs, all-inclusive craft beers, wine, soda/water, live music entertainment and a chance to bid on the silent auction items to benefit the Humane Society Naples and Gulf Coast Humane Society. There will also be an opportunity to vote for the Mercedes-Benz of Bonita Springs Best “First Bite” winning dish! Once you have ordered, you will receive an email confirmation (please print your tickets and bring them with you to check in. We look forward to seeing you at this most enjoyable fundraiser! • Net Proceeds benefit the Humane Society Naples and Gulf Coast Humane Society.